Josh, you have recently had some good news with your soccer, what was it? 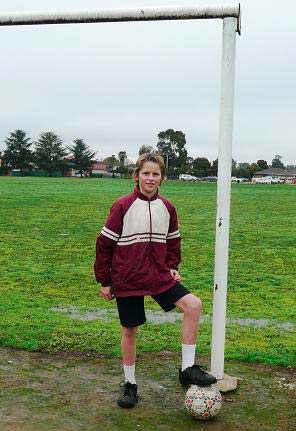 I have been selected for the Country Victoria Under 13 Soccer Team. I’m really excited about it! It is a great opportunity and will be a good chance to learn. It is a great step in my soccer career. I think I was about 7 when I started playing properly, and I am 12 now. When I was little I used to kick the ball around with my family. Then I started playing at school before I heard about the Saturday league. When I started playing for a team I loved it straight away. It was always so much fun when I got out on the field, an adrenaline rush. Why do you like playing soccer so much? It is a very tactical game, but also very exciting. Soccer is really fast moving and so while you are doing one thing you have to be thinking about the next move. You have to really concentrate and work hard but it is an awesome feeling when you win a game or save a goal! How do your family feel about you being selected? Mum was really excited but a bit surprised because I am an underage keeper (I could get selected again next year because I am younger). The other keeper is a lot bigger and a year older than me! Mum is very proud of me. Well my aim is definitely to get selected again next year. I would really like to make it into the Allstars team of 24 players, which is selected from this tournament. In the long term, I will take any soccer opportunities that come along!